Locations and dates have been set for Wine Spectator's 2014 Grand Tour events. My sister-in-law (@DCSas) lives there! We'll have to monitor this and see which dates work best all things considered. Hope to make one of these, and hope to see you there! Question of the Day: Any chance you'll make it to one of these this year? If so, which one? So I'm working from home today and I get an email from VinoDivino offering a 90 point (Wine Spectator) Oregon Pinot Noir for $15.95. 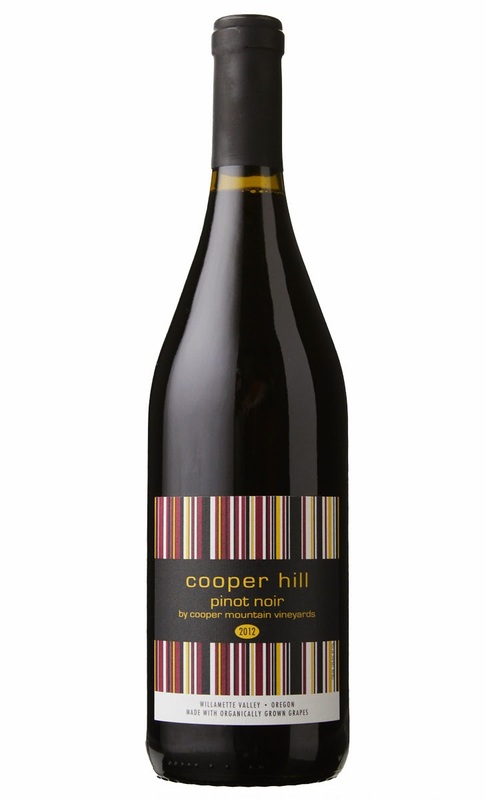 Coincidentally, the latest issue of the magazine arrived today with newly released ratings for Oregon Pinot Noir and sure enough - the 2012 Cooper Mountain Cooper Hill Willamette Valley Pinot Noir was rated 90 points with a release price of $18. It's been a while since I've endeavored to find a $20 Oregon Pinot Noir to get excited about. But I was game for trying this one since Vinodivino made it so easy. They sleuthed out the rating, they ordered it, wrote up the email, offered it a good price, and offered same-day delivery for a flat fee of $1.95. They were smart enough to point out that the overnight lows with wind chill was going to be below zero so why not let them deliver? 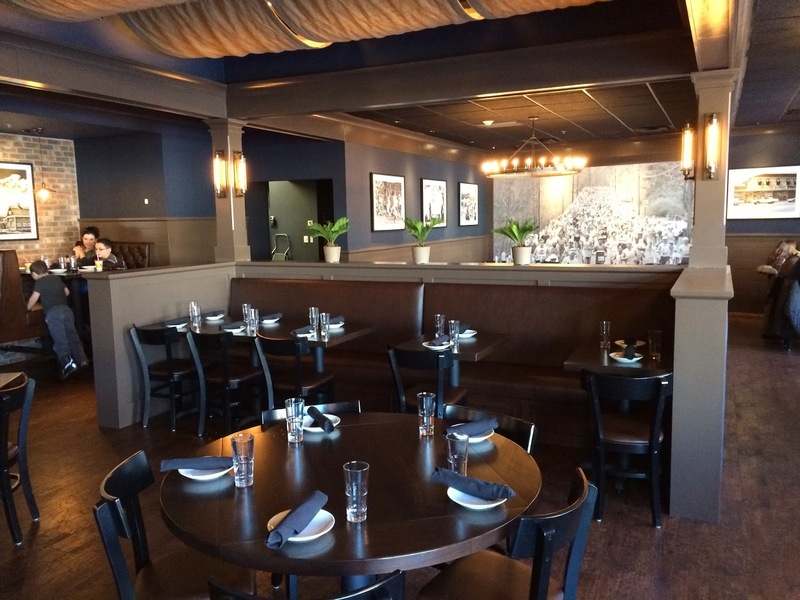 Vinodivino now has locations in Newton, Brookline, and Needham. Their model has long hinged on triangulating professional ratings combined with their perspective to provide a focused assortment of wines with high scores and reasonable prices. They've recently upped their efforts to make it easier than ever to get their wines delivered at reasonable prices whether that be by same day delivery ($1.95 flat fee if you're in their coverage zone) or via FedEx ($9.95 a case). The drive over to Needham takes like 15 minutes without traffic. On a cold winter night with snow remaining on the ground during peak traffic times it would probably be more like 45 minutes - and something I wouldn't make a priority. But with an offer like this where I could turn a review on a potentially high QPR wine like this the same day I couldn't resist. They removed all of my potential objections. Nice job guys. Well done. I placed the order around 2:00 pm. They promise same-day delivery between 6-9 pm. My two bottles arrived at 6:20 pm. Terrific! It could not be easier. Vibrant magenta in color, but mostly transparent. Simple strawberry notes with a hint of fake grape overtones. Mild mannered and a bit flat on the mid-palate with a short finish. Enjoyable but priced in line with its quality. The same-day delivery option from Vinodivino in conjunction with their eye for highly rated yet affordable wines makes theirs an email list Boston-area wine enthusiasts should check out. When I think of how many months some wine deals drag out it's refreshing to hear about a wine, taste it, and publish a blog post about it within 6 hours. I think Wine Spectator's 90 point rating on this wine is inflated. Harvey Steiman covers Oregon for the magazine and he's turned me on to a number of terrific values. The 95 rating he bestowed on the 2010 Domaine Serene Evenstad was a great call. But I think he got carried away with this one. No biggie - for $17/btl fully loaded it's still a solid play. In Pursuit of Balance is a movement championed by Rajat Parr, Jasmine Hirsch, and others seeking to build momentum behind the idea that the best California Pinot Noir and Chardonnay can deliver balance between fruit, acidity, structure and alcohol. It started in 2011 featuring a tasting of like-minded wineries in San Francisco. This year, a tasting is being held in New York City on February 4th, 2014. The 32+ member wineries listed below give you a good idea of the type of producers we're talking about. The tasting sounds like a great way to quickly build up familiarity with producers of this appealing style. A promising producer but I haven't quite found a groove with them yet. Some bottles have been great, others not so great. You seem to get what you pay for with them. Their $20 bottling is a solid 88 point offering. Haven't explored much being that. I'm actually surprised they're in this group. I thought their 2009 Central Coast bottling was a fruit bomb. No personal experience but tons of positive chatter. Would love to try. One of the standards amongst terroir-driven CA Pinot producers. Pricey but a great one to taste at an event like this. I've only had their low-end bottlings but they've got quite a following. I've only tasted one bottle. I liked it, but thought it was fairly ripe. Really nice producer. I wish their appellation bottling were a little more remarkable because their single vineyard Pinots are oustanding. I really like what I've tasted from Flowers. If there was such thing as a steakhouse Pinot it would Flowers. That being the case I'm surprised to see them in this group. I've heard the name for sure but haven't tasted. I've tried many times but don't buy often. Has a hard time supporting the price point of their higher end bottlings for my taste. I think there's great value in the Kutch appellation bottlings (Sonoma Coast). The Savoy Vineyard bottling has been an utter disappointment when tasted both blind and non-blind. Gorgeous bottles. Haven't taseted their Pinot but liked their Chardonnay. I like what I've tasted. Related to Alta Maria (which I'm a huge fan of) but I've never tasted. Tasted at Cochon 555 but haven't shelled out the $ for at retail yet. Well regarded. Lots of experience here. Their '07 Heaven & Earth bottling was one of the best Pinot Noirs I've ever tasted but it's riper than most of their offerings. Visited with Paul Sequeria when he was with them. And recently visited their tasting room (fun, no appointment needed). Rajat Parr's winery. I didn't like what I've taseted. I've heard of them but haven't tasted. Surprised they're on this list because aren't they Silver Oak's Pinot arm? And isn't Silver Oak known for being, well, oaky? I've only tasted Twomey once and wasn't overly impressed. I like what I've tasted from Tyler Pinots a lot. 92 points on a couple bottles including an affordable appellation bottling. Check 'em out. I like what I've tasted but frequently seems to fall in that 89 point range. Question of the Day: What producers would you most recommend seeking out at this tasting? 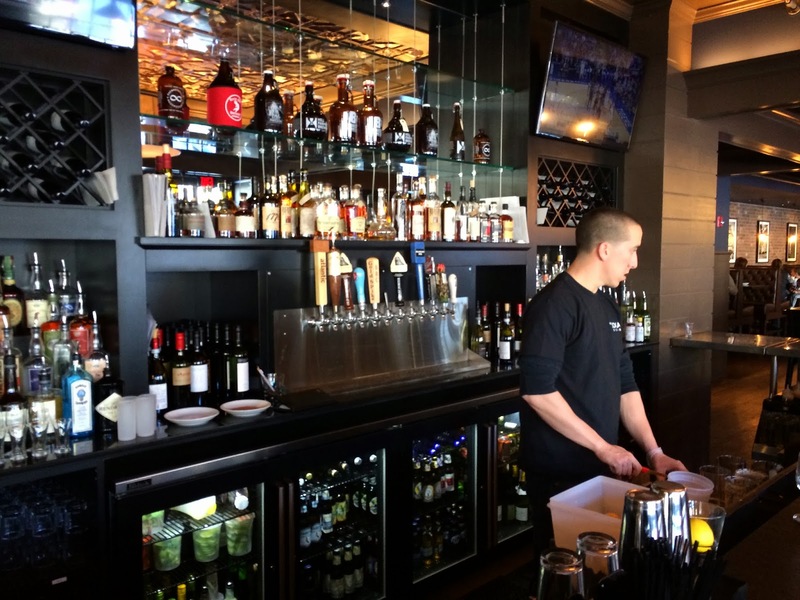 The Local Kitchen & Drinks -- an upscale casual family-friendly pub with existing locations in Newton and Wayland -- opened recently in Wellesley to much fan fare. It replaced China Sky which was an incredibly clean and overall outstanding but often empty Chinese restaurant. 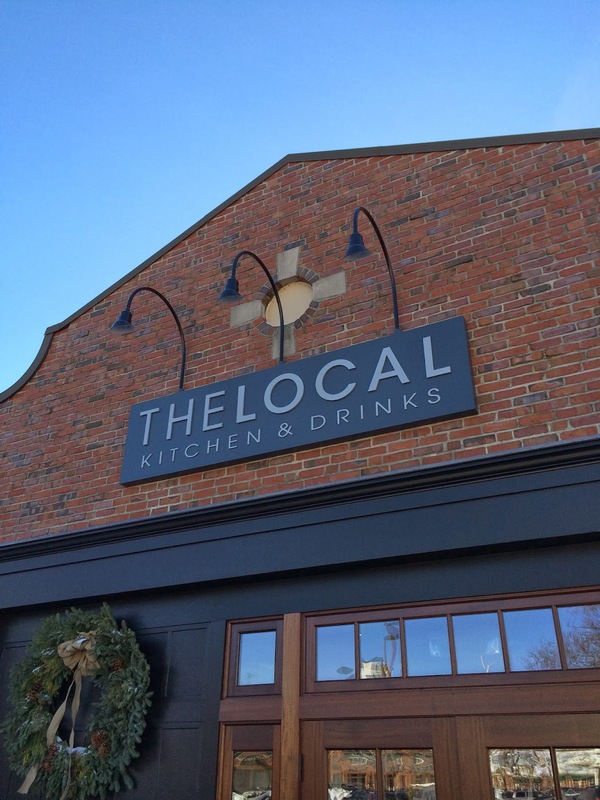 The addition of a restaurant like The Local is a welcome addition. 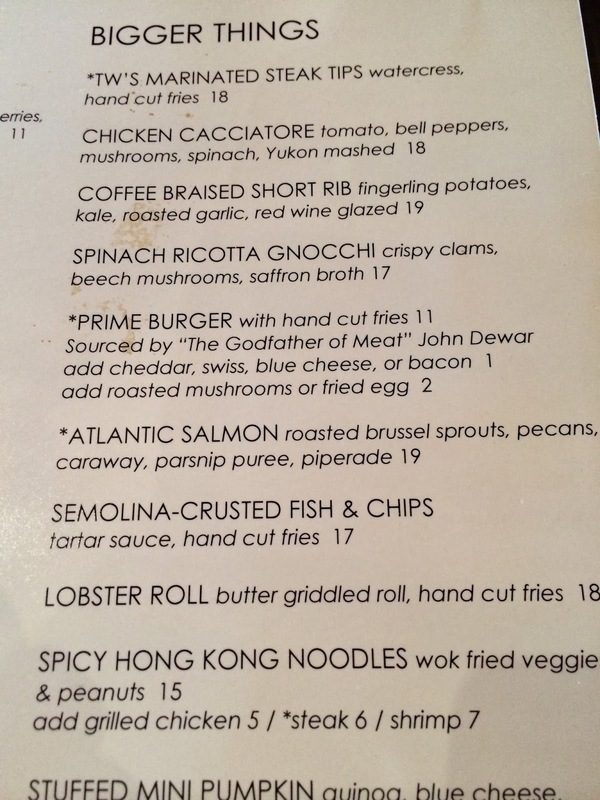 Wellesley has lacked a sit-down restaurant where you can get an $11 burger. They just recently started opening for lunch, and I'd heard unfavorable reports of an uncomfortably crowded parking lot and service glitches on weekend nights so I thought visiting during less crowded lunch hours would be a good play. ...which strikes a very nice balance between cozy and comfortable with clean modern lines. Brown and blue hues along with unique lighting that strikes the perfect balance between modern and vintage. Though we didn't sit at the bar area it seemed welcoming. I believe they still need to adhere to 'ye olde Wellesley tradition of requiring food to be ordered to get a drink at the bar. The pub atmosphere definitely lends itself more to beer than wine and they had a nice, focused list of beers on tap for $7. 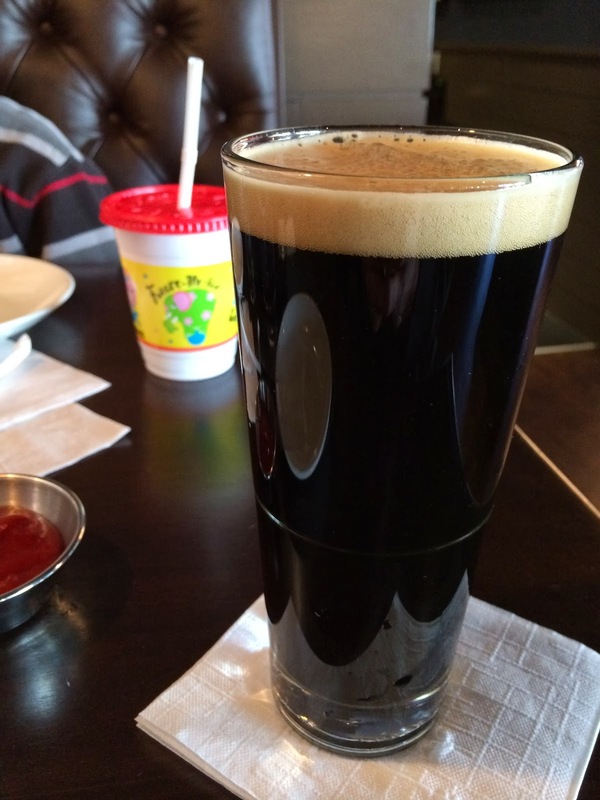 I went for a Bar Harbor "Cadillac Mountain" Stout from Bar Harbor Brewing Company. I'd never had it before but thought it was Very Good+ (Beer Advocate link) with a very nice touch of toasted chocolate wrapped around a classic Irish stout frame. 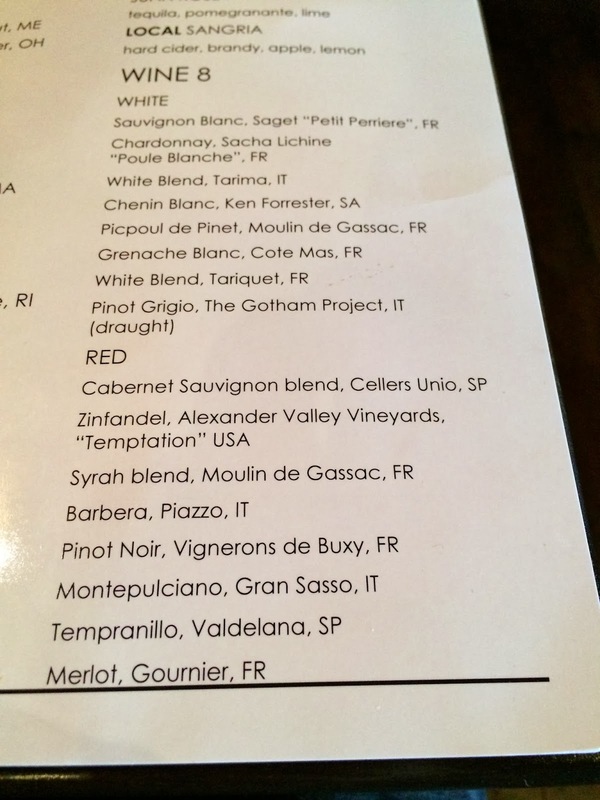 The wine list, entirely by the glass with no bottle offerings as far as I could tell, was far less local. In fact it wasn't even domestic. Most of the selections were, strangely, from Europe. I'd love to see some local wines like Travessia (here's why), Westport Rivers, and Turtle Creek. But even if they don't want to go that far I think their wine program would be more successful with recognizable domestic brands. But whatever - it definitely feels more like a place to get a beer anyway so it's not that big a deal. The menu showed a good amount of diversity yet didn't offer so many offerings as to be overwhelming or unfocused. The Coffee Braised Short Ribs sounded good, as did the Spicy Hong Kong Noodles, but especially because of the John Dewar association I went for the burger. I love the price point of their Prime Burger: $11. Wellesley has, strangely, lacked a sit-down $11 burger in a setting like this. The Cottage's burger goes for $13.95 but the atmosphere there points you in other directions (and the food on average isn't very good in my experience). 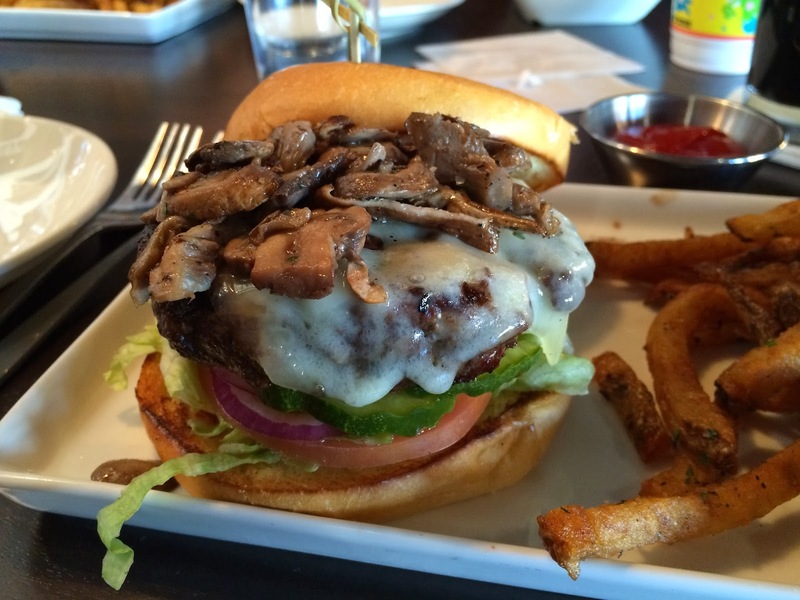 I had it tricked it out with Swiss and Roasted Mushrooms. I'm torn on whether it was a really good burger. It looked pretty good, and I appreciated the toppings providing isolation between the burger and the bottom bun so the bun didn't get soggy. Although the burger was very juicy in terms of how it dribbled onto the plate when I picked it up, it seemed a little dry. I ordered it "medium" and it was pink in the center so I don't think it was overcooked. In hindsight perhaps it was a lack of seasoning that made it seem just a bit lackluster. The fries were well seasoned and very good. 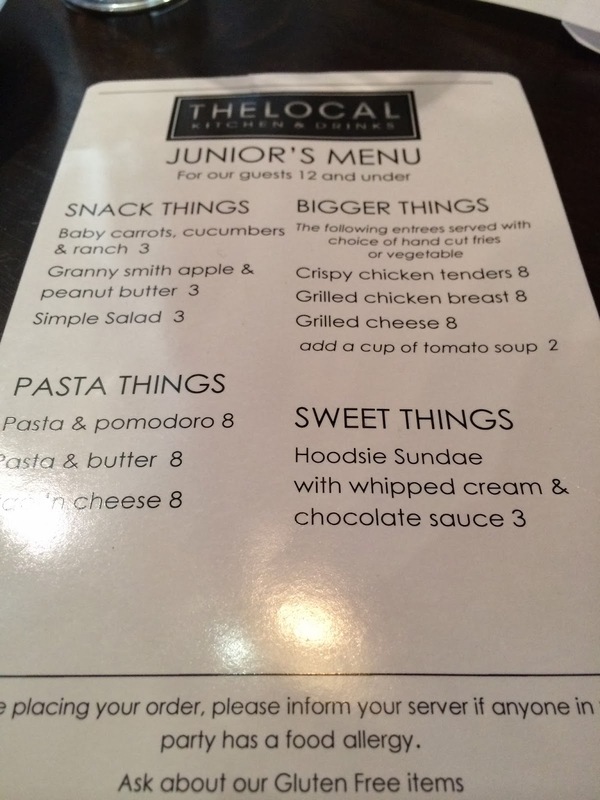 They have a "Junior's Menu" which was appreciated with our little dudes (now 6 and 8) joining us. They both went for pasta dishes which were very simply prepared but enjoyed. $8 seemed a little steep especially since it didn't include drinks or a dessert. @RobertDwyer good news - we've decided to no longer charge for kids fountain drinks. TY for your feedback! Wow! You've got to appreciate that they're listening and still tweaking the formula. 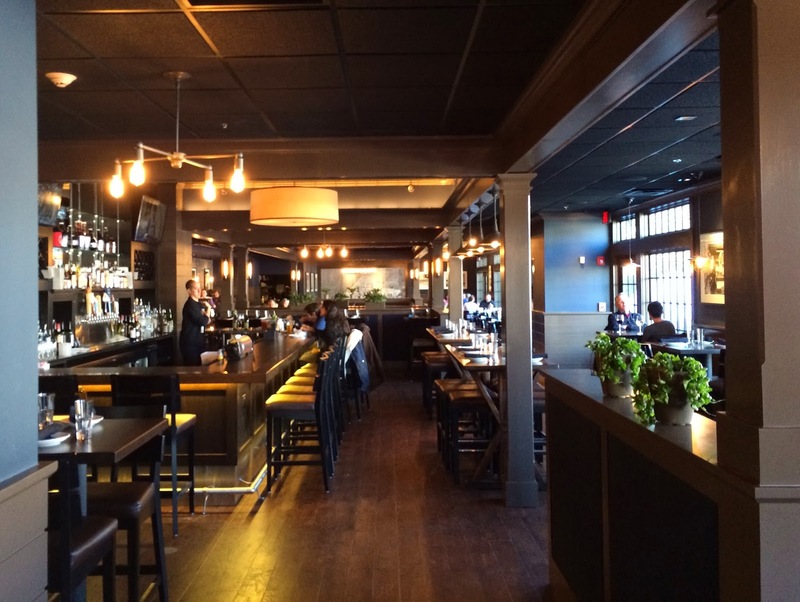 The Local is a welcome addition to the Wellesley dining scene. The town really needed a restaurant like this and I can think of a lot of situations where we'll find it hits the spot. Perhaps like The Cottage, the food could use a little more flavor to be more memorable. Lunch set us back $60+ with tip (2 adult entrees, 2 kids meals, 2 kids drinks, 1 beer) which seems a tad pricey. We'll definitely be back though. I think it's going to be a very successful restaurant. 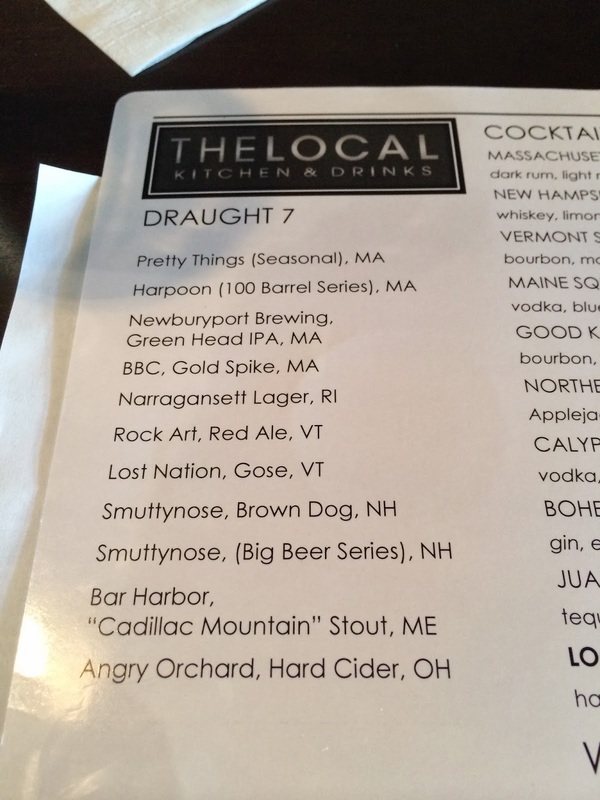 Question of the Day: Have you been to The Local? If so, what did you think?